Lots of people tend to learn to play guitar by themselves. But not all of them know ways to become a good guitarist when getting started. If you are in this case and find our guide here, CONGRATULATIONS! It’s because we are going to show essential tips that are helpful for beginners to gain the right path to play guitar better and better. 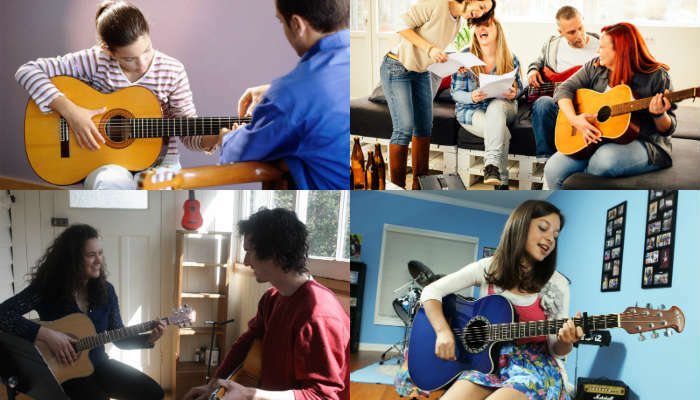 10 tips to Become a Good Guitarist – Check Now! As newbies, looking for the best guitar seems a daunting task. You might consider the overall guitar for new players, for small hands, for left-handed or an acoustic guitar. 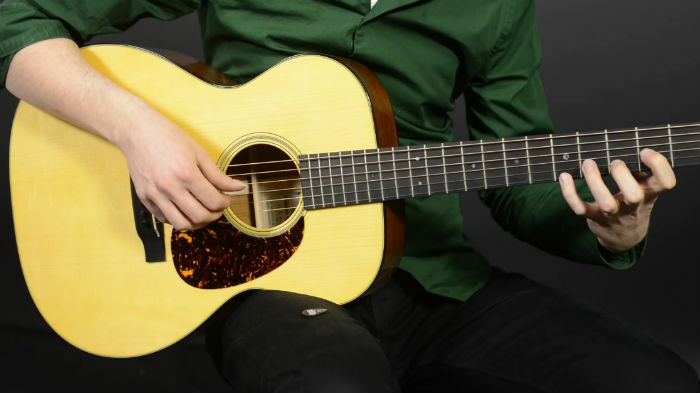 Don’t worry too much since you can visit Best Beginner Guitar Today to select the one that is suitable for your demand most. This website boasts a great list of the best guitars for beginners by offering great and detailed information. Try to access now, and you will know why we suggest it. After having the guitar, the next and essential step is to be patient, guys. Although we always want to learn the guitar as quickly as possible, we also know that it requires persistence and patience. Or the more we try to chase the process of learning, the more significant bad habits we get. When starting to learn, you MUST commit to it for the long haul in order to make great strides in playing guitar. It’s best to practice about 20 minutes from 3 to 5 days a week. Relying on that, you can progress your ability quickly. 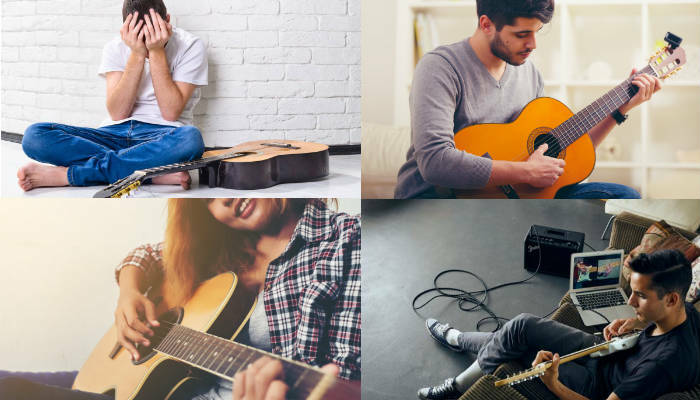 To improve your guitar playing, you must be disciplined and motivated to find something new; to learn and practice every day will contribute to the better skill. 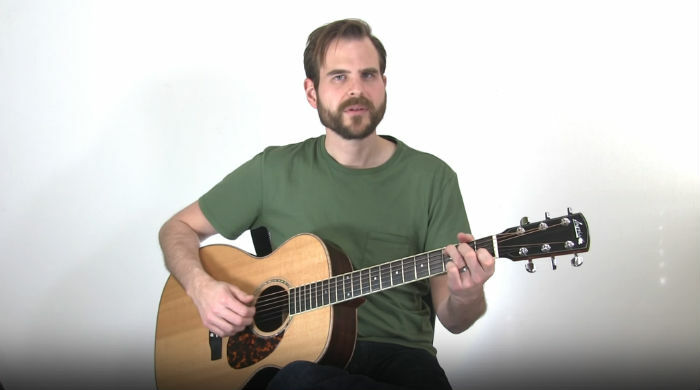 The simplest way is to learn one guitar-related thing that you did not know already such as a lick, a chord, a melody, a strumming pattern, an altered tuning, etc. And soon you recognize that you are taking in as much as you possibly absorb on the guitar, of course, every day. If you are about to start, you will get BIG issues with chords because you need to synchronize multiple fingers at the same time. So, try to focus on scales by playing on the finger at a time! Then, when starting playing chords, your brain instantly knows the particular positions as chords are a small piece of scales. From there, you can learn and perform chords much quicker if you have practiced more scales before. How to start with scales? In case you are fond of rock, it’s best to begin the minor pentatonic scale. It’s because a massive chunk of the rock library avails the minor pentatonic scale. Importantly, it’s effortless to learn. If you decide to learn some classic rock solos, you should learn about the shapes. Practice often consists of maintaining exercises, highlighting your strengths, and concentrating on particular goals after warming up. Spending time practicing to an ideal minimum and separating the topics to be addressed into small chunks also helps to prevent wasted effort and leave time to play. 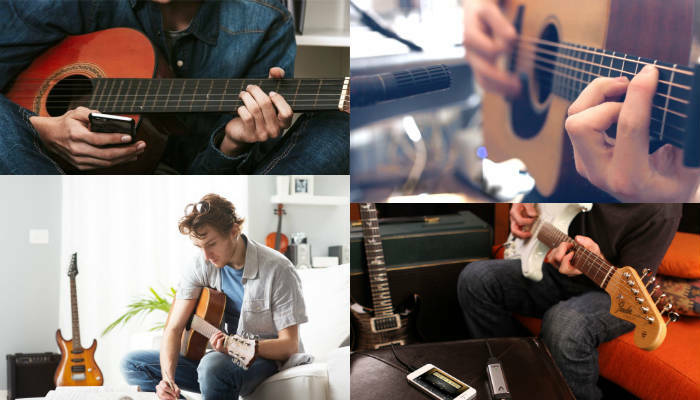 Ideally, you should have three to six or more hours every day to play on your guitar. However, the time you have available is basically less. As stated above, planning for 20 minutes of consistent daily practice is a good start. And when you get into this habit, you can find ways to spend more time practicing. In fact, 20 minutes per day of focused practice is helpful for development than a 2-hour session every once in a while. As long as you maintain a steady and reasonable schedule, you will get the best result after all. 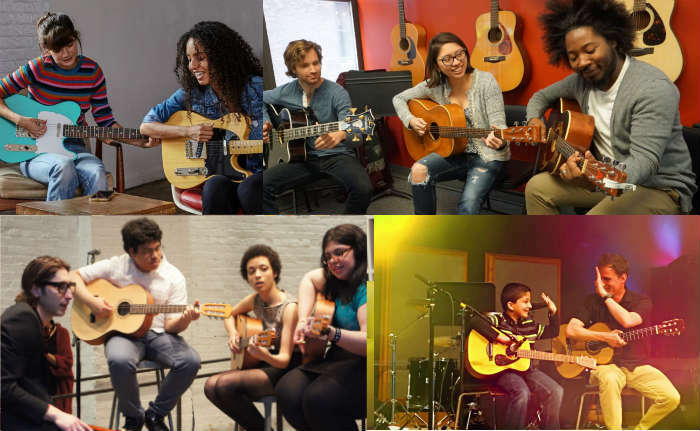 As a guitarist, learning to keep the rhythm is one of the necessary skills you MUST acquire. It’s okay to practice and enhance this by playing along with jam songs or tracks on YouTube, playing along and locking in with the beat or playing along as much as possible. Additionally, when learning scales, you should avail a metronome to practice. Make sure to start slow at first. Then if you feel comfortable, you can build up speed gradually. It’s best to look for other musicians to play with, jam and hang out together. Relying on that, you can learn more things, i.e., you can ask to collect jam sessions or play your favorite songs. Or look for and join a band. In case you cannot find any group, simply create your own one by scouting about people who have the same interests and skill levels. In sum, playing in a band is the last learning process for musicians in general and guitarists in particular. You will be able to learn and improve, along with trial and error, to acquire the necessary skills and then become a good player. Recording yourself is another good way to see your guitar playing justly as well as motivate yourself to do better. You can put your iPad, iPhone, computer or any recording device and start recording. When listening to what you’ve recorded, you can realize what you like and dislike about your playing. Everything will be easier to define your strengths and weaknesses and then you will know what to improve. If necessary, you are able to make a video of yourself which shows the positioning of your fingers, arms, hands, back, and shoulder. But, avoid using too much because watching might distract your fresh ears. So, it’s best to try both separately. You also record when playing rhythm or other complementary parts like melodies, leads or counterpoints to learn about composition, production and entirely performance. In case you focus on the complementary sections, you can see your scope and vision improves. And when you work to make complete songs, your capacities develop quickly. Another benefit of recording is that you always keep a record of your progress as a player. That means your journey of a guitarist is one of the consistent developments. Recording yourself is a great way to determine how far you have attained. The development of any guitar player can be improved by the pure knowledge of the growth of that development. When you expand the discipline to be learning and practicing daily, it’s vital to keep a diary or log of your improvement process to enhance development further. Try to write down what you are practicing every day such as what songs, chords, scales, solos or riffs you are going to perform. And keep in mind to observe your practicing time at the same time. What needs improvement and what is improving? What are your challenges, struggles, and faults? Etc. Then search for a way to deal with your problems. And don’t forget to avail a metronome to write down your beats per minute every time. As a whole, tracking and evaluating your progress will help you focus and understand what and why you are practicing. Moreover, seeing the progress keeps you continuing and offers the confidence so that you can gain your guitar objectives. Sometimes, you would feel a bit jealous when seeing a good guitarist playing a song you love. Then you went home and tried to practice. Ego was getting the way, mainly when you played with others. So, the best way is to stop comparing yourself to others instantly. Only compare yourself to yourself. Record yourself and listen back to track your progress and see how you develop every day. In case you feel like your ability is not developing despite daily practice, you should relax and do something fun. For instance, you can play new things for a couple of days or try to work something out. Then come back to the place you were before and try again. Don’t quit when you have no idea of where you want to be. Just try and do slowly to gain your goals after all. 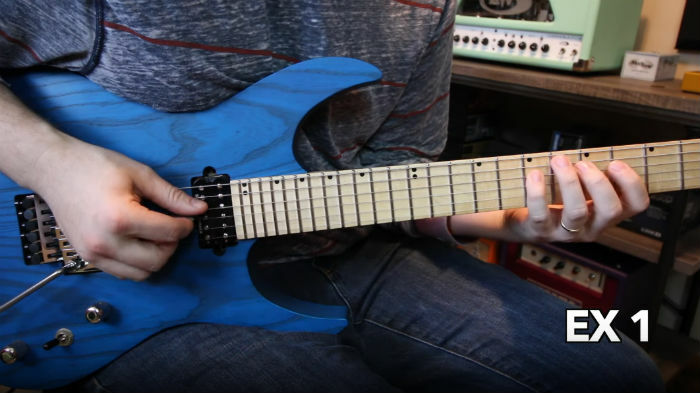 By consulting our 10 tips above, you are guaranteed to become a good guitar soon. NOTE that it’s a path for you and you need to stick to what you believe. Believe in your progress, your goals, and your playing. Believe in yourself as a musician in general and a guitarist in particular. And believe in what you think is good and right for your ability. Moreover, don’t forget to make it fun because enjoyment always makes you long for more and offers you the quickest progress. It’s time to PRACTICE and PERFORM more to improve yourself and hope you will succeed in your musical goals as soon as possible.